Happy World Soils Day! Check to see what the Soil Science Division has posted on the NRCS Soils and World Soils Daypages. World Soil Day is on December 5th! Stay tuned each Wednesday the Soil Science Division is posting something new, until December 5th. If you would like to view the new and important information visit NRCS Soils and World Soils Day. In Portsmouth, NH a Poorly and Very Poorly Drained Soils Workshop is being held on October 26th! Click here for the info New Hampshire Association of Natural Resource Scientists. HANDOUTS from MAPSS soils workshop held at the University of Maine, Orono forestry center. Click here for The NRCS National Engineering Handbook Chapter 7 and click here for the soil and site worksheet. Click here for The Site Specific Soil Mapping PowerPoint. September 5th, 2018 MAPSS soils workshop from 8:00 am to 4:00 pm at the University of Maine, Orono forestry center. Excavator dug soil pits to be examined by participants in order to develop a Connotative Soil Survey, or "HISS" style of mapping. How to assign Hydrologic Soil Groups (HSGs). State Soil Scientist Tony Jenkins and Chris Dorion to moderate. Afternoon to feature a presentation by State Soil Scientist Tony Jenkins on "Soil Survey Work Planning Session" for soil related projects in Maine. Click here for directions and click here for the registration information. MAWS Annual Meeting & Winter Conference will be held March 22nd, Starting times include: Registration at 7:45am, the Conference at 8:30am, and the Annual Meeting at 3:30pm. 2018 Soil Matters Conference will be held on April 4th at the Audubon Center in Concord, NH. To view click here. The 2018 Winter Newsletter is now available, to view click here. Don't forget to sign up and mail your checks out for the 2018 Annual Meeting at Unity College on March 7th, registration can be downloaded here. The Agenda has also been Updated and is available here. The 2018 Annual Meeting is set for Unity College on March 7, 2018. To Register click here. The 2017 annual treasury report is available here. Happy World Soil Day! The Global Soil Partnership (GSP) is celebrating today to the theme "Caring for the Planet starts from the Ground". More information click here. State of Maine Agricultural Trades Show, Jan. 9-11, 2018, Augusta. More information click here. SSSNNE 2017 Fall Meeting will be held Friday December 8th, at the Great Bay Discovery Center located at 89 Depot Road in Greenland, NH. Meeting topics include SSSNNE's Publication of Hydric Soils Version 4 updates, harmonization impacts to Publication #5, AoT Rules and Web Soil Survey Meeting Agenda and Registration can be found here. Maine Soil Health Workshop, Dec. 5, 2017, Waterville. Speakers include Extension educators, crop advisors, and farmers, who will discuss their research and experiences with soil health strategies on dairy and vegetable farms. Cost (includes lunch): $20 if registered by Wednesday, Nov. 29; otherwise $25. More information and registration click here. MAPSS 2017 Fall Workshop Handouts part #1 are available here and the Handouts part #2 are available here. MAPSS 2017 Newsletter is available here dont forget to sign up for our Fall Workshop on September 6th! 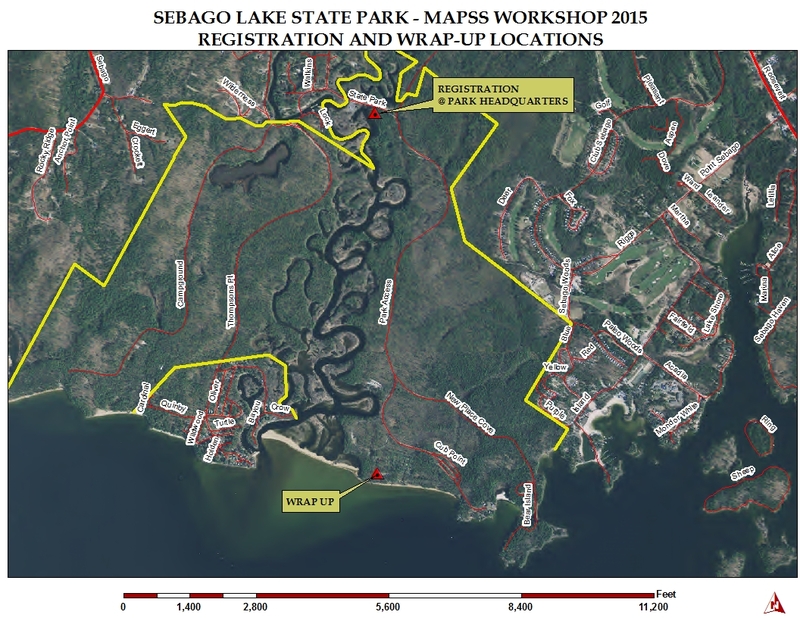 MAPSS Workshop has been shceduled for September 6th in Searsmont, ME. Registration, Location and Agenda can be found here. Maine Association of Wetland Scientists is hosting a Wetland Mitigation Workshop Friday, August 11, 2017 8:00AM – 12:30PM at the University of Maine Memorial Union Bumps Room, Orono, Maine. Registration details can be downloaded here. The New England Hydric Soil Technical Committee's Field Indicators for Identifying Hydric Soils in New England Version 4, May 2017 is now available for review and download here. MAPSS next field workshop has been shceduled for September 6th in Searsmont, ME. Registration, Location and Agenda to be posted shortly. MAPSS Annual meeting has been reshceduled for Wednesday, March 29. See you all there. MAPSS Annual meeting has CANCLED due to the storm! Further details of a new time will be posted shortly. The Society of Soil Science of Northern New England (SSSNNE) is hosting a Soils Matters Conference and is occuring April 18th at the NH Audubon, Silk Farm Rd., Concord, NH. The deadline to sign up is April 7th. The registration form and agenda is now available here. The Maine Association of Wetland Scientists (MAWS) Winter Confrence & Annual Meeting is occuring Thursday, March 23rd at Bowdoin College. The deadline to sign up is Friday, March 13th. The newsletter, registration form and agenda is now available. The registration and agenda is available here. The newsletter is available here. The winter newsletter and the registration form is now available. The meeting agenda is in the newsletter. The deadline to sign up is Friday, March 10th. This will ensure that you are guaranteed a meal. The registration is available here. The newsletter and agenda is available here. Participate in the FREE 2017 Science and Technology Conservation Webinars presented by the USDA NRCS its open to the public and CEU's are available after completion of the training. Click here to schedule your desired webinars. MAPSS 2017 Annual Meeting on March 15th is scheduled at the Wells Common Meeting Center at the University of Maine in Orono. Registration and Agenda to be posted shortly. SSSNNE is hosting an upcoming Hydric Soils Workshop in Concord, New Hampshire on October 28th 2016 co-sponsored with the NH Association of Natural Scientists. You can refer to the flyer by clicking here. Please spread the word. 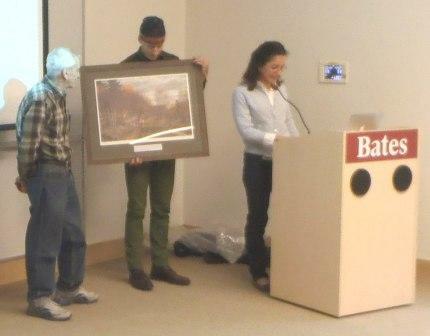 A photo of Dave Rocque accepting his award at our annual meeting on Thursday, March 24th, 2016 at Bates College, in Lewiston. The Sebago Lake State Park Soils and Natural Resources Workshop is to be held on Wednesday, September 7, 2016. Where else would you want to be in September after all the tourists head home for the winter but on beautiful Sebago Lake. Last year we had great weather – sunny and in the 80’s. Let’s hope for the same again. If you missed it last year, you don’t want to miss this one. If you came last year, there will be a few things different this year. I’ve heard there will be at least one station with the wetland delineated in the field. We hope to see you all there. The accompanying location map for the workshop can be downloaded here. The description and Agenda is available here. Common Ground Fair is scheduled on September 23, 24, and 26th! Please don't miss out on the soil trench that will be on display. We would like to recognize the accomplishments durring the International Year of Soil of 2015 and have left this link to view all the great activities that occurred. Multidecadal Response in Soil C, N, and Hg to the 1947 Mt. Desert Island Fire Using Paired Watersheds in Acadia National Park, Maine presented by University of Maine Master's Student Michael Jakubowski is available here. Why Improving Soil Heath is Good for Your Soil & Your Business: A 30+ Year Perspective presented by Chris Bales, Casella Organics, Portland and Unity, ME is available here. The Future Of Soil Mapping Using LIDAR Technology presented by Jessica Philippe; NRCS Saint Johnsbury, Vermont, Soil Survey Office is available here. An Overview of Recent NRCS Changes in the Classification and Description Standards when Describing Urban Soils presented by Nick Butler; USDA-NRCS 12-DFX Soil Scientist is available here. The Winter Edition Of The Lay Of The Land has recently been updated and is available here. MAWS is hosting a Bat Workshop with the Regulators on March 09, 2016 at the Viles Arboretum in Augusta, from 8 AM - 12 PM. See the attached flyer here. The MAPSS Annual Meeting is scheduled for Thursday, March 24th, 2016 at Bates College, in Lewiston. Registration and Agenda is available here. The Publications Page has recently been updated. The State of Maine Catena key has recently been updated, all Dixfield soils have been correlated to Peru soils. The SSSNNE Annual Meeting is scheduled for Tuesday, April 19th, 2016. Registration, Location and Agenda to be posted shortly. The MAPSS Annual Meeting is scheduled for Thursday, March 24th, 2016 at Bates College, in Lewiston. Registration and Agenda to be posted shortly. The MAWS Annual Meeting is scheduled for Thursday, March 31st, 2016 at Bates College, in Lewiston. Registration and Agenda to be posted shortly. MASE Annual Meeting is scheduled for Tuesday, February 23rd, 2016 at the Ramada in Lewiston. Registration and Agenda to be posted shortly. 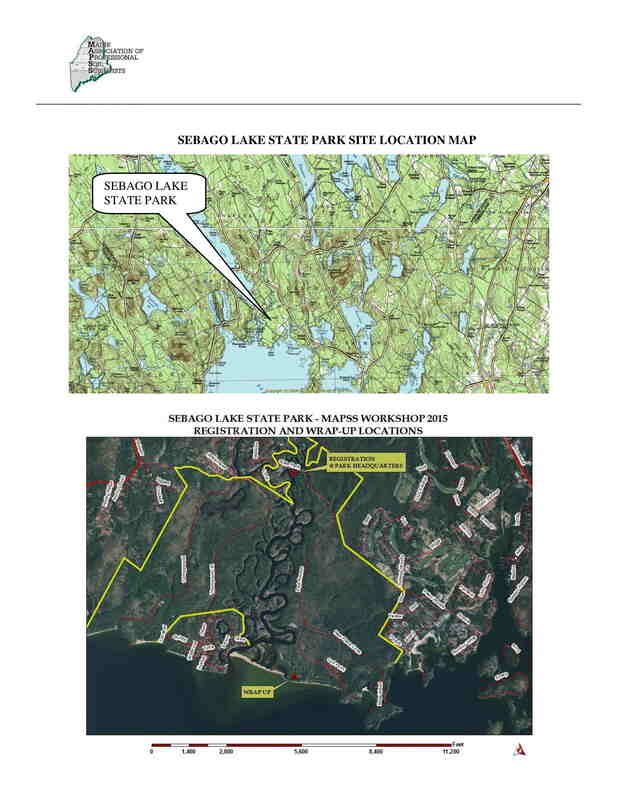 The 2015 Natural Resource Workshop at Sebago Lake State Park, was held on Septemeber 9th. The Site 4 (boulder field and vernal pool) Connotative Soil Survey can be downloaded here. The accompanying location map for the workshop can be downloaded here. Three job opportunity announcements in Maine for a Soil Conservationist (Recent Graduate) GS-0457-5/7 FPL9 has been posted. The positions are located in Bangor, Houlton and South Paris. MAPSS 2015 Annual Meeting was held at Unity College Center For The Performing Arts on Wedsday, March 4th 2015. Download the conference Agenda, and registration form. Map #1and parking Map #2. Its the International Year of Soils and the Soil Science Society of America is offering a 6 month trial membership for free. The MAWS Winter Conference and Annual Meeting, is scheduled for Tuesday March 24, 2015, at Thorne Hall at Bowdoin College, in Brunswick, Maine! This is the same venue as last year! More details to follow. Please mark your calendar! MAPSS is requesting news articles from its memmbers at this time. Please send all articles to Don Phillips. MASE Meeting is Scheduled for Feb. 24. The joint MAPSS - MAWS - MASE late summer field workshop was held at Mt. Blue State Park on Wednesday, September 3rd, 2014. Download the field workshop information, conference Agenda, and registration form. Download the digital orthophoto with driving directions and the location of the registration area and afternoon panel discussion location: Map #1. Thanks to all who contributed to the organization and staffing of this important workshop, especially to Dave Rocque, without whose enthusiasm and persistence this workshop would not take place. The summer 2014 issue of The Lay of the Land is now available for downloading. MAWS is hosted a workshop on August 1st, 2014: Wetland Functions & Values - 2014 Assessments and Updates. Full and Associate Member directories were updated on May 16, 2014 by Gary Fullerton, Chris Dorion, and Matt Dorman. Please verify the accuracy of your data; if further changes are needed, please email web master Chris Dorion. The winter 2014 issue of The Lay of the Land is now available for downloading. The MAPSS Annual Meeting was held on March 18th, 2014 at the Wells Conference Center at the University of Maine in Orono. Download the Agenda and the Registration form. The proposal from the MAPSS Technical Committee for adoption of the Connotative Soil Survey (CSS) and accompanying Explanation and Usage Guide was approved at the Annual Meeting of March 18th, 2014. And the Order I mapping ("High Intensity Soil Surveys"; i.e., Class A, B, C, D) map will still need to be performed. Please view the comparison chart for the two mapping styles for additional details. Minimum size map units for wetland delineation: The following guidance is provided by U.S. ACOE Senior Project Manager Jay Clement. It evolved from the panel discussion at the September 4th, 2013 MAPSS field conference at Mt. Blue State Park. Jay Clement can be reached at the Maine Project Office, (207) 623-8367. "Getting back to you and the group as promised on the question about mapping protocols. After discussing the question with Ruth Ladd and Paul Minkin at our MA headquarters, they confirm that there is no definitive guidance to fall back on in the '87 Corps Manual or the Regional Supplement. Similarly, there isn't any informal guidance to fall back on. And at least the New England states appear to all have variable requirements as to the size wetland that gets mapped." "So some best professional judgment and common sense has to prevail here. Is the wetland just an isolated pocket or is it part of some larger pit/mound landscape. If it's the latter, the regional supplement does offer guidance as to when areas are wetlands and when they're not. A delineator could therefore make a call that a pit/mound landscape wasn't a wetland even though there might be 'pockets' of hydric soil, hydrology indicators, and wetland plants. Your map/plan would reflect that." "But when all you're dealing with is a traditional landscape that happens to have some wetland 'pockets', there is technically no minimum threshold for mapping if an area meets all 3 parameters. Many of these folks are already identifying and mapping vernal pools or potential vernal pools down to pretty small sizes. Wetland mapping really shouldn't be much different. How it appears on a plan will undoubtedly be a function of the plan's scale. On a small scale map, small wetlands, drainages, vernal pools, etc will probably only be represented by a symbol, a dashed line (drainage), or a point. A larger scale map lends itself to greater detail in terms of depicting an actual boundary." "However you make the call, document, document, document (so that third parties understand why you determined what you did). And when in doubt, contact the Corps and the DEP." Coarse fragment descriptions in the National Soil Survey Handbook have been updated. Please check out this link to coarse fragment descriptions. The MOOSABEC series has replaced the Waskish series. These are very poorly drained organic soils. For more information, visit the links in the left navigation column SOIL DATA and head to the OSD descriptions. Note that this soil series is in the frigid temperature regime. Ricker soils are now limited to the cryic temperature regime. For more information, visit the links in the left navigation column SOIL DATA and head to the OSD descriptions. MAPSS has overhauled the MAPSS display board. If you need it for a presentation, please contact Johanna Szillery, Education Chair. M.A.W.S. Annual Meeting was held on Wednesday, March 26th, 2014, at Thorne Hall, Bowdoin College, Brunswick. The Soil Science Society of Northern New England (SSSNNE) held their Annual Meeting on Thursday, February 27th, in Burlington, Vermont. The Agenda can be downloaded. Directions the Annual Meeting can be downloaded. On Thursday, September 26th, plan on attending the MASE Field Day at Pineland Farms in New Gloucester, Maine. Backhoe-dug soil pits will be available for morning inspection, followed by an afternoon discussion. 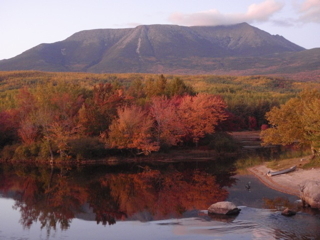 October 11-13th: 3 days, 17 individual, day-long field trips, including bedrock, glacial, pedology, archaeology, and mining trips in the Katahdin region. 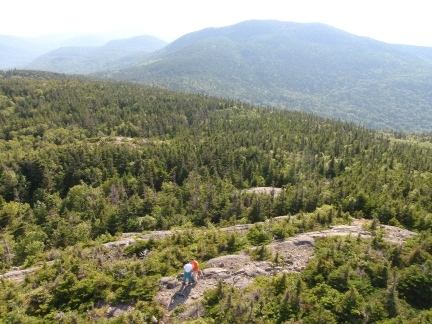 Pre-registration is required at New England Intercollegiate Geological Conference. Download the summer 2013 edition of The Lay of the Land. Penobscot River Restoration Great Works & Veazie Dam Removals and the Sedgeunkedunk Steam Restoration. Sponsored by Ecological Landscaping Association and Society for Ecological Restoration - New England Chapter. Thursday, August 8, 2013 10:00 AM – 4:00 PM; $35.00 ELA & SER Members - $40 Non-Member. Link to the PDF flier for more information. MAWS presents a workshop Delineating Federal Wetlands Using the Northcentral/Northeast Regional Supplement, Thursday August 8th, 2013, 9:00am-3:00pm - Smiling Hill Farm, 781 County Road, Westbrook, Maine. Link to the MAWS website for more information. NHANRS & SSSNNE present a SOIL MAPPING WORKSHOP: Principles, Process & Techniques. FRIDAY AUGUST 16, 2013, 8:00am - 3:00pm, Dover, NH. Link to the PDF flier for more information. The Janet Engle Cormier Memorial Scholarship Committee voted on March 27th, 2013 to split the $1,000 award to two deserving candidates, Aaron Englander and Cayce Salvano. UMaine-Orono plans to have an awards ceremony on Wednesday, April 17 at the University’s Fogler Library, and MAPSS President Don Phillips will hand out $500 checks to each of them at the ceremony. 'Chapter 5 (of the "Supplement" manual, on p.114: "In general, wetland determinations on difficult or problematic sites must be based on the best information available to the field inspector, interpreted in light of his or her professional experience and knowledge of the ecology of wetlands in the region." The MAPSS Annual Meeting is scheduled for Tuesday, March 12th, 2013. The Agenda and registration form can be downloaded. The MAWS Annual Meeting is scheduled for Monday, March 25th, 2013. Please visit the MAWS website for the meeting Agenda and Registration. Early registration discounts apply. The SSSNNE (SOIL SCIENCE SOCIETY OF NORTHERN NEW ENGLAND) Annual Meeting is scheduled for Friday, February 15, 2013 at the Maine Audubon Gilsland Farm Facility in Falmouth, Maine. Download the Agenda and Registration forms. Also, be sure to visit their website. The MASE Annual Meeting is scheduled for Tuesday, March 5th, 2013. The Maine Water Conference is scheduled for Tuesday, March 19th, 2013. Visit their website for more information. The Northeast Section of the Geological Society of America Annual Meeting is scheduled for Monday through Wednesday, March 18th to 20th, 2013. Visit their website for more information. 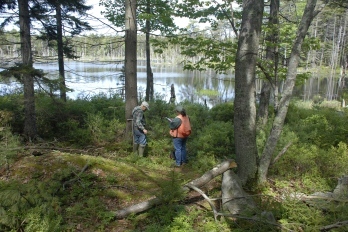 Maine Audubon and other project partners are holding several Stream Smart workshops. Undergraduate and graduate students are encouraged to apply for the Janet Engle Cormier Scholarship Award. Completed applications are due March 8th, 2013. Stantec has two wetland / natural resource scientist positions open. Please use this link for further details. MAWS is hosting an afternoon workshop MAINE INLAND WADING BIRD AND WATERFOWL HABITAT WORKSHOP, to be held on Tuesday, October 2nd, from 1 to 5pm at the Augusta Elks Lodge. The annual MASE field day is scheduled for Thursday, September 27th. Please download the PDF registration and information form. The expert workshop soil pit descriptions, vegetation lists, and photos have been compiled on a separate page. Thanks to Dave Rocque, NRCS staff Nick Butler and Bob Evon for continuous pumping of pits, NRCS staff Dave Wilkinson and Greg Granger for pedon descriptions, the City of Augusta Public Works Department, MAPSS, MAWS, and MASE volunteers, the Urban Soils 2012 field workshop was a success. 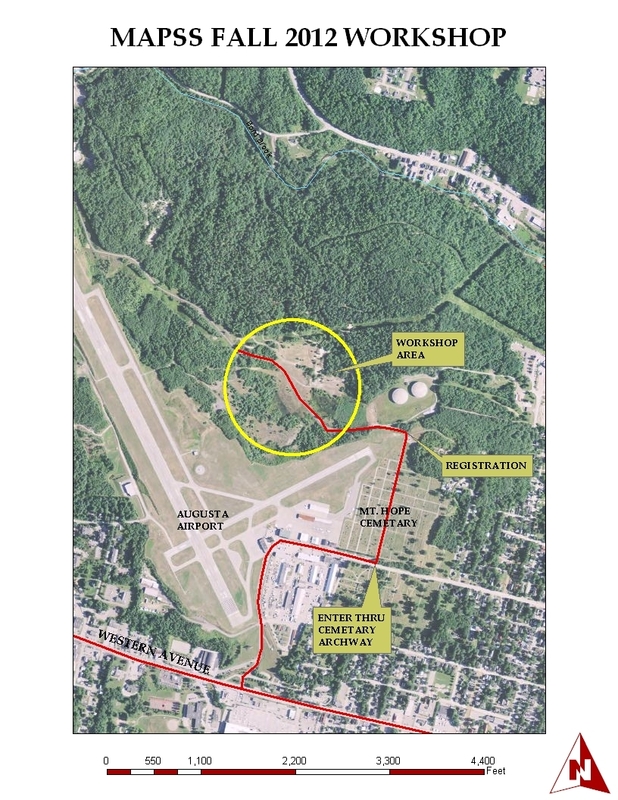 The 2012 MAPSS/MAWS/MASE Urban/Altered/Disturbed Soils Workshop will be held at the Augusta Bond Brook Trail System Site at the end of the Augusta Airport in Augusta, Maine on September 6, 2012 from 9:00 am until 3:00 pm. Download the registration form. This workshop is of interest to those natural resource professionals who typically encounter sites with altered soil conditions ("made land"; udorthents; filled and regraded sites), altered hydrology, and the often unusual florisitic taxa that are observed on these sites. For further description of the workshop, please download the full workshop description. The color orthophoto for the workshop location can be downloaded here. The proposed new taxonomic classification for anthropogenic soils can be downloaded here for tomorrow's workshop. The MAPSS brochure is now available. Please download the PDF preliminary version and submit comments to Johanna Szillery by October 15th, 2012. The summer, 2012 edition of The Lay of the Land is available for downloading. Technical Tour north to the foot of Katahdin and the Golden Road in Penobscot and Piscataquis Counties, Maine. We’ll see some of the typical pedons described by NRCS soil scientists in the North Woods, such as Nicholville, Chesuncook, Monadnock, Colton, Kinsman, and Adams. NRCS soil scientists will have lab data on some of these pedons as well. We’ll cover related topics such as glacial geology, hydric soils, and elemental distributions of the major soil series in the North Woods of Maine. We are planning X-ray field exercises at sites with lab data. Bus departs from UMaine campus for Millinocket and North Woods. * Bus fee, snacks, lunch and lobster banquet are included with Technical Tour registration. The cost of the workshop is $75.00 for MAPSS/MAWS/MASE members or associate members. For planning purposes, we ask that you email Gary Fullerton or Johanna Szillery by June 11, 2012. Please see the Registration Form for more information about the tour itinerary, agenda content, and registration information. 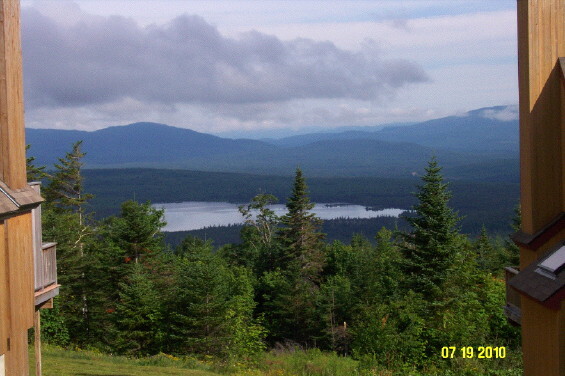 View of Katadhin from the Golden Road, Maine's highest mountain. A modern analogue for what Maine looked like ~12,000 years ago. 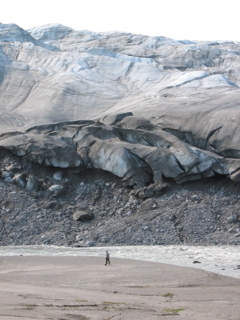 This is the margin of the Greenland Ice Sheet. Several parent materials are being produced: glaciofluvial outwash, ablation till, and aeolian (wind blown) sands. If you wish to stay at hotels listed on the website, they are honoring lower room rates for the “Soils Conference” participants until 15 May. Changes to the MAPSS Guidelines: The Membership voted to suspend the section on Oxyaquic Conditions, pending field trials set to begin during the early summer of 2012. These field studies will evaluate the relationship between drainage class & hydrology, redoximorphic features indicative of saturation, and timing of the growing season. 1.	are in slight to strongly concave positions in the landscape but may be on a uniform slope. 2.	have a very stony to rubbly surface that may be covered with organic duff. 3.	have vegetation that is shallow rooted but not because of dense till, bedrock, very coarse textured soil horizons, or a seasonal water table with redoximorphic features present. 5.	have an A or thickened A horizon where better drained soils in the vicinity do not have an A or have a thin A horizon. 6.	are less well developed than better drained soils in the vicinity. Commonly, they will classify as Inceptisols while better drained soils in the vicinity will classify as Spodosols or have spodic properties. 7.	have evidence of organic matter streaking or different shades of olive and brown in the B horizon (poly value and/or poly chromatic). 8.	have vegetation that is hydrophytic or the vegetation is upland but has evidence of stress such as tree roots growing along the ground surface, multi- stems and/or buttressing. 9.	have a large contributing (upslope) watershed to create the groundwater table and for the hydraulic gradient necessary to push it along." The MAPSS Annual Meeting was held on Friday, March 16th at University of Southern Maine - Portland campus. Meeting Agenda and registration form should be downloaded. The registration deadline is MARCH 7th. Adopting a new format for PD and VPD that follows the style of the keys found in Keys to Soil Taxonomy, Eleventh Edition, 2010. Converting inch measurements to metric as the primary standard, but still retaining the inches in parentheses. The full minutes of the MAPSS Technical Committee can be downloaded here. The Technical Committee is comprised of Christopher Dorion (Chair), George Bakajza, Greg Granger, Steve Howell, Tony Jenkins, Dave Marceau, Dave Rocque, Johanna Szillery, and Dave Turcotte. The January, 2012 ACOE Regional Supplement has several changes. Download the 2 page document here. The Full Member and Associate Member Directories were updated today. In order to be listed, one's membership dues for 2011 must be current. Please review for accuracy by linking to the "Directory of Members" at left and following the instructions. The FULL MEMBER and ASSOCIATE MEMBER directories are now in HTML format. Please link to them using "Directory of Members" link at left. Please scroll to your individual data cells and note any changes / additions / corrections, and then e-mail them to Chris Dorion, Webmaster. Publication of Field Indicators of Hydric Soils in the United States Version 7.0 is now available in electronic format. Download it here. Please contact: Gary Fullerton if your e-mail address changes and you wish to remain on the MAPSS bulk e-mail notification list. This is the primary means of communication now. The 11th edition of Keys to Soil Taxonomy, as well as a summary of all changes for this new version of the Keys, are available at the NRCS website. The 2009 MAPSS Guidelines are now uploaded. Use the link at left "Publications + MAPSS Guidelines" to download the PDF files. The 2009 Executive Committee was elected at the Annual Meeting on March 10th. Use the link to the left for the new E.C. and Committee Chair list and e-mail contacts. Check out the Chesuncook soil monolith at the Smithsonian Museum of Natural History (scroll down to Image #11) in Washington, D.C. MAPSS raised over $10,000 for the monolith display. NCSS Newsletter Issue #58 can be downloaded here. Download the PowerPoint presenation Seasonal Water Table and Temperature Relationships in Calcareous Till and Residual Soils of Central Maine. Once you have downloaded the .PPT file and opened it, adjust the slide window upward, and you can read the accompanying "Notes" for each slide. MAPSS Executive Committee Meeting is scheduled for Wednesday, January 25 at 4:30pm. This will be a conference call-in meeting, largely focused on firming up the Annual Meeting Agenda, approving expenditures for the meeting, Scholarship/Education Committee update, Newsletter update, and Nominating Committee update. Please let me know if you plan to call in. As we’ll be voting/approving financial matters, Executive Committee representation is important. Thank you! Johanna Szillery, MAPSS President. Solicitation of articles for the MAPSS Newsletter. Please e-mail submissions of articles, photos, interesting soils-related work, or announcements to Amy Jones .JPEG and MS Word file types preferred. The MAWS Annual Meeting has been scheduled for Thursday, March 29th. Check the MAWS website for updates. Notice from Jay Clement, Senior Project Manager, US Army Corps of Engineers We still see some reports from some wetland scientists that use boiler plate language to the effect that "the wetlands were delineated in accordance with the 1987 Corps of Engineers Wetland Delineation Manual". The standard throughout New England is use of the '87 Manual AND the Regional Supplement. If delineators are using the supplement, they need to document it; if they are not, their delineations are not meeting standard and they face the risk of the Corps and/or the DEP rejecting the delineation. Both the manual and the supplement may be accessed off our web site. For more information please call the: Maine Project Office, (207)623-8367. November issue of the NCSS newsletter can be downloaded using Adobe Reader. The link is here. Soil Workshops - Registration deadline is January 4th for Soil Surveying, GPS, GIS, and Fundamentals in Soil Science are available here, and here and and here. Download the Agenda and Registration forms. CEU's for New Hampshire soil and wetland scientists are now self reporting each biennial period. For more information on this new system, go to the New Hampshire Joint Board. 6 CEU hours will be granted to Maine Licensed Site Evaluators. Staff from DHHS will be present at the workshop. 6 Contact Hours will be granted to Maine Licensed Plumbing Inpsectors. The MAPSS Executive Committee will be holding a teleconference meeting on Thursday, March 31, from 4-5:15pm. For more information, please contact MAPSS President Johanna Szillery. Spring 2011 jobs announcements can be viewed here. The MAPSS Annual Meeting was be held on Wednesday, March 16th, 2011, at the Wells Conference Center, University of Maine, Orono. Download the PDF Agenda. You must pre-register by Wednesday, March 2 to reserve lunch. The New Hampshire Board of Licensure for Natural Scientists has granted 1.0 CEU for New Hampshire Soil Scientists; 1.0 CEU for New Hampshire Wetland Scientists; 3.0 PDH's for Maine Licensed Site Evaluators for the full day meeting. NHANRS, the New Hampshire Association of Natural Resource Scientists will be holding a workshop on Thursday, March 24th titled: "Scenic and Recreational Values of Wetlands". Link to additional information here. The Maine Association of Wetland Scientists is holding its annual meeting on March 24th, 2011 at the Maple Hill Farm Conference Center, in Hallowell, Maine. A recently added Google Earth hot-link enabling the spatial data set for the North Maine Woods soil survey documentation, including each soil series' Type Locality, the sampled pedon, full lab data, and soil description. The Maine Association of Wetland Scientists is holding the VERNAL POOL ROUNDTABLE DISCUSSION, PART 2, on Wednesday, December 8th, in Augusta. Download the PDF Agenda. You must RSVP by Friday, December 3rd, to Sarah Watts. When: Thursday, September 30th, 2010. Begins at 8am, finishes mid-afternoon. Where: Andy's Agway (off Route 5), Dayton, Maine. Cost: $20 for MASE & MAPSS members, $25 all others Free for Students Enrolled in College Soils Classes. *PAY AT THE DOOR, BUT RSVP BY MONDAY, SEPTEMBER 27th. Schedule: 8am to 12:noon --> Test Pit Review (at leisure). 10am to 12:noon --> NRCS Discussion of MAPSS Test Pits. 12:noon to 1pm --> Lunch (Pizza, Soda, & Chips). 1:pm to mid-afternoon --> Powerpoint Presentation of Test Pits. *Full day attendance at this workshop provides 6.0 PDH’s to Licensed Site Evaluators. Be sure to email or call Gary Fullerton at gfullerton@sebagotechnics.com or 856-0277 x256 if you want lunch!!! From Exit 36 (Saco) on the Maine Turnpike: Take the first right after coming through the toll booth, and at the stop sign take a left onto the Industrial Park Road. Go one-quarter mile to the light and turn right onto Route 112. Go two and a half miles and turn left onto Louden Road (look for the white vinyl fence on left. The road will be right after it). 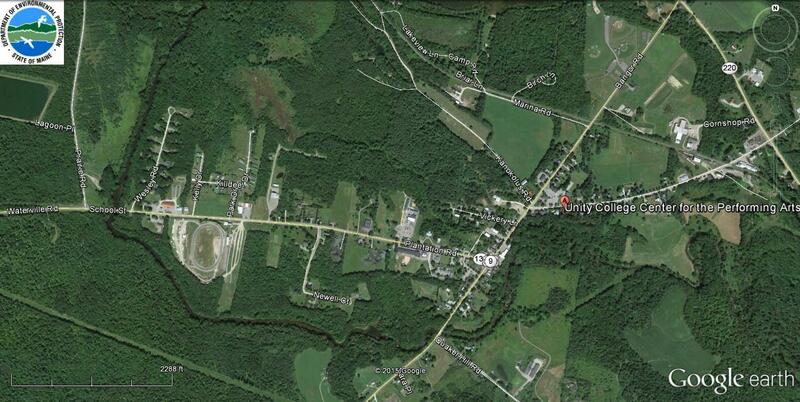 Follow Louden Road for two miles and at the stop sign, turn right onto Route 5. Go two miles and look for the Andy's Agway DOT sign; River Road will be on the left. The store is just over a mile down the road on the left. From Exit 32 (Biddeford) on the Maine Turnpike: After going through the toll booth, turn right onto Route 111 until you reach the junction of Routes 111 and 35. Turn right onto Route 35 at the light. Follow Route 35 to the stop sign at the junction of Route 5. Turn right onto Route 5 and go two and a half miles and look for the Andy's Agway DOT signs. River Road will be on the right. The store is just over a mile down the road on the left. From Sanford/Springvale/Route 4 and the Kennebunks: Follow Route 111 East (in center of Alfred) for 6 miles to the junction of Route 35, then turn left. Follow directions to Route 5 as stated above. Cool Climate Soil, Hydrology & Site Evaluator Soil Pit Classification Field Workshop at Saddleback Ski Resort in Rangeley, Maine is scheduled for WEDNESDAY, SEPTEMBER 1st, 2010. The above photo shows a high elevation (CRYIC) rock outcrop - Saddleback Soil (Lithic Humicryod) complex. The photo at right shows Saddleback Lake and views to the north. Lodging information in the Rangeley area can be found here. There will be a social gathering, dinner, and campfire on Tuesday evening, August 31st in Rangeley. We have reserved the group camping area at Rangeley Lake State Park. Details can be found here. Heart of Maine Resource Conservation & Development announces their winter agricultural soil conference in Bangor on February 9 & 10, 2010. Use the link to access the registration materials. SSSNNE Winter Meeting & Workshop on anthropogenic and disturbed hydric soils, scheduled for Friday, February 26, 2010 in Concord. Download the registration and agenda form. Determination and delineation of wetlands using both the existing 1987 ACOE Manual and the Draft Interim Regional Supplement to the Corps of Engineers Wetland Delineation Manual: Northcentral and Northeast Region. 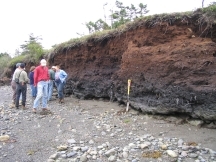 Parent materials to include: glacial till, marine sediments (Presumpscot Formation), coastal sand dunes, and alluvium. Download the field conference description and registration form. Download the DRAFT Interim Regional Supplement to the Corps of Engineers Wetland Delineation Manual: Northcentral and Northeast Region (5.7 megabytes). You must register by 9am and participate throughout the day, including the afternoon panel discussion, in order to receive CEU Certificates of attendance that will be available at the conclusion of the workshop. Photo on left shows a challenging forested wetland? or upland dominated by Picea rubens and Abies balsamea. Photo on right shows a challenging wetland delineation along a Great Pond. A soil scientist and botanist will be available at each transect. Photo on left shows glacial till with water in the soil pit. How does the Hydrology parameter match the soil morphology? Photo on right - are those redoximorphic features in the Bs horizon? 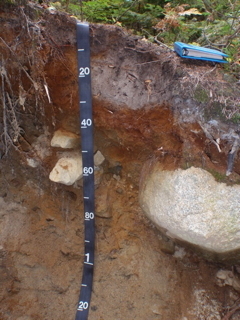 Photo on left shows a soil pit in marine sediment (Presumpscot Formation). Is this a Scantic (poorly drained) or Lamoine (somewhat poorly drained) soil? Try keying out the drainage class using both the New England Indicators and the new National Indicators. Photo on right shows the afternoon discussion session with State and Federal regulators in the pavillion. This is also the lunch area. BRING YOUR OWN LUNCH AND DRINKS. This workshop should have broad appeal to soil scientists, wetland scientists, site evaluators, code enforcement officers, planners, municipal officials, regulators, lake association members, foresters and the general public. You can participate at whatever level is appropriate for your background and knowledge of wetland delineation and septic system soil pit evaluation (the experts at each transect site will provide the level of assistance you require). Be sure to tell the ranger at the gate that you are registering for the MAPSS workshop. Otherwise, you will be charged $4.50 per person to enter the park. Parking is limited, so PLEASE CAR-POOL to the extent practicable. MAPSS ANNUAL MEETING WAS HELD ON Tuesday, March 10th, 2009 at the Maple Hill Farm Inn & Conference Center in Hallowell, Maine. The National Indicators for Identifying Hydric Soils: Paul Minkin, US ACOE, will discuss the field testing of the Interim Northeast Regional Supplement to the 1987 ACOE Wetland Manual with the help of local experts familiar with the New England Field Indicators ( some MAPSS members helped with the field testing in Maine and can answer questions on a comparison of the two soils keys). He traveled throughout New England field testing the Supplement and will use a PowerPoint presentation of the results. His talk will cover soils, vegetation, and hydrology, with a focus on vegetation and hydrology. Steve Roberge, Third Party Inspector, will discuss the unique hydrology of high mountain areas and erosion control techniques necessary to construct projects there (from an engineer's prospective). He will use a PowerPoint presentation of his experience as a third party inspector. Please download the AGENDA and REGISTRATION FORM and return by Friday, February 27th. Download the document MEMO with comments to Jim Cassida regarding the Site Law Application. Download the 2008 Annual Meeting Minutes by using the link at left. The membership will need to approve these during the morning business meeting. The New Hampshire Board of Licensure for Natural Scientists has awarded 1.0 CEUs for both WETLAND SCIENTISTS and SOIL SCIENTISTS for those atteding the day-long meeting. The Subsurface Wastewater Program, Division of Environmental Health will allow three 3.0 professional development hours for the March 10th, 2009, Maine Association of Professional Soil Scientists, Annual Meeting. EXECUTIVE COMMITTEE MEETING scheduled for 1pm on Friday, November 21st, 2008, in Belfast. Meeting is open to MAPSS members; contact info@mapss.org for more information. Agenda to focus on planning for the 2009 MAPSS Annual Meeting, increased support for the UMaine Soil Judging Team, maintaining the relevance of soil mapping as land use ordinances change, and updating the MAPSS Guidelines for the new expedited soil surveys. UMAINE SOIL JUDGING TEAM placed 5th out of 11 universities. Photos and summary page. Read the full report by Mary Beth Parent. The Invitation is attached which includes a schedule for the day, a map of the location, and directions to the site from Interstate 95. The New Hampshire Board has awarded 2.0 CEUs for NH licensed soil and wetland scientists. The workshop is free for all members of MASE or MAPSS. Cost is $10 for all others. or call me at 856-0277 if you plan on attending so I can purchase a meal for you. If I don’t hear from you, I can’t guarantee there will be food for you. NOTE - for past year's photos and reports, go to "Past Events & Workshops...." in the left navigation pane. Summer edition of THE LAY OF THE LAND was mailed to active members on July 24th. The PDF version will be posted in mid-August. The MAPSS membership voted in the majority at their annual meeting on March 11th, 2008, to endorse the efforts of the THE MAINE ASSOCIATION OF WETLAND SCIENTISTS to seek licensing of wetland scientists in Maine. Download the letter here. Please review the minutes from last year's annual meeting (go to navigation column at left, click on meeting minutes, scroll down - it's a PDF file). Please review the Exec. Comm. meeting minutes (on left navigation pane) from June 1, 2007 regarding Licensing of Wetland Scientists in Maine. The MAPSS membership will be voting whether to endorse/not endorse MAWS's efforts. Please read the background letter from the MAWS Certification Committee to MAPSS, presented at the June 1st MAPSS Exec. Comm. meeting. Please go to Final Exploratory Paper on the Issue of Credentialing Wetland Scientists in Maine (03/02/2007) for more background information on this issue. 1.0 CEU will be awarded for New Hampshire Certified Soil Scientists. For past CEU credits in Hew Hampshire, go to theNH Board of Natural Scientists. Wetlands of Special Significance in the S.Z. Hydraulic connectivity in the S.Z. The New Hampshire Board of Certification for Natural Scientists has granted 2.0 CEUs for this workshop, for both WETLAND SCIENTISTS and SOIL SCIENTISTS. You must register by 9am and participate throughout the day, including the afternoon panel discussion. Certificates of attendance will be available at the conclusion of the workshop. Photo on left shows the transition zone from low marsh (Spartina alterniflora) to high marsh (Spartina patens) to upland salt intolerant forested vegetation. Photo on right shows workshop participants delineating the salt tolerant vegetation from freshwater vegetation (Typha angustifolia, Spartina patens from Rynchospora alba, Cladium mariscoides, Aster nemoralis, Drosera rotundifolia, Sphagna ssp., Vaccinium ssp.). Photo on left shows a group determining the normal high water mark of a Great Pond and the starting point for beginning the Shoreland Zoning measurement. Photo on right shows a group determining whether a water course meets NRPA "River, Stream, Brook" criteria. Photo on left shows bedrock outcrop with interspersed wrack lines and mixed freshwater/halophytic vegetation. The survey method will be used to determine the Highest Annual Tide line for Shoreland Zoning purposes. Photo on right shows the afternoon discussion session with State and Federal regulators in the pavillion. This is also the lunch area. BRING YOUR OWN LUNCH AND DRINKS. Download the spring brochure describing seminars in Surveying, Soil Science, Local and State Planning, and Engineering Management. New Hampshire CEUs available. SSSNNE Annual Meeting February 22, 2008 at USM: AGENDA and REGISTRATION. If you need a certificate for the August 2nd, 2007 "Natural Resources Identification and Regulation" field conference held at Reid State Park, please send an e-mail to: Chris Dorion (or, 866-7806) with your name as you need it to appear on the certificate of attendance. Documentation substantiating the validity of New England Hydric Soil Indicator XI is urgently needed by Dave Rocque(or, 287-2666). 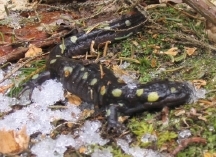 This request is being made in light of ACOE's proposal to develop a Northeast Region supplement for the 1987 Wetland Manual that will use Field Indicators of Hydric Soils in the United States instead of our own Field Indicators for Identifying Hydric Soils in New England ( we have been told we have no choice in the matter). I have a number of issues with this approach but the one I am sending this e-mail about is the lack of anything in the National Indicators that resembles New England Indicators XI.a and XI.b. In order to plug the gap, we have been told by the ACOE that we have to submit our own indicator, written in the format of the National Indicators, that is accompanied by documentation that the indicator is valid. Ideally, that would be a profile description, vegetation plot data and groundwater monitoring data. Lacking that, profile descriptions and vegetation plot data would be good and any accompanying groundwater table observations (during the growing season) would be better. If we have weak data, they may accept the new indicators for testing only. If the data is good, it may be accepted as new indicators for use in our region. My biggest concern is that we may end up with a regional manual that results in a significantly different wetland boundary than would be delineated now (unless our present criteria is too conservative and can be documented as such). Even worse, would be the need to use two separate documents that result in differing wetland boundaries (an ACOE boundary and a state and/or local boundary). The data is needed as soon as possible since the draft Northeast Region supplement will be developed very soon. I have been told that the material must be submitted to the National Committee for Hydric Soils by the end of January in order to make the Committee's annual meeting. Our own New England Hydric Soils Technical Committee next meets on January 9 and I would like to take the data with me to that meeting. Immediately below is my attempt at writing indicators XI.a and XI.b in the national format. A layer with a depleted or gleyed matrix, starting within 50 cm (20 inches) of the soil surface. The layer(s) immediately above the depleted or gleyed matrix, to a depth of less than 30 cm (12 inches), must have 5% or more redox depletions and must be immediately beneath a layer with a value of 3 or less, chroma 2 or less or an organic matter layer. User Notes: This indicator applies to soils that have a black surface layer less than 30 cm (12 inches) thick with a value of 3 or less and chroma of 2 or less. Any layers between the dark surface layer and depleted or gleyed matrix layer must have at least 5% redox depletions. A layer with a depleted or gleyed matrix, starting within 50 cm (20 inches) of the soil surface. The layer(s) immediately above the depleted or gleyed matrix, to a depth of greater than 30 cm (12 inches), must have 5% or more redox depletions and must be immediately beneath a layer with a value less than 3 and chroma of 2 or less. User Notes: This indicator applies to soils with a black surface layer 30 cm (12 inches) thick or thicker with value less than 3 and chroma of 2 or less. Any layers between the dark surface layer and depleted or gleyed matrix layer must have at least 5% redox depletions. 2008, 20-23 February, National Society of Consulting Soil Scientists Annual Conference, Myrtle Beach, SC. Visit: NSCSS website. The 30th annual meeting will be held on Tuesday, March 6th, from 8am to 4pm at the Augusta Elks Lodge. Download the Meeting Agenda. Download the March 7th, 2006 Annual Meeting Minutes. These must be voted on during the business meeting. Download the proposed amendment to the MAPSS Constitution. This must be voted on during the business meeting. Download the Meeting Registration. Registration is due by 12:noon on Friday, February 16th, 2007. As of March 6th, 2007, MAPSS has raised $10,194.74. Our goal was $10,000.00 Thanks to the tireless efforts of Don Phillips for seeing this project through to completion. Our State soil, the CHESUNCOOK series, will now be dislayed at the Smithsonian Museum of Natural History, in Washington, D.C. Check the link to the left for a list of CONTRIBUTORS. Please contact Don Phillips for fundraising informaton. What will this exhibit look like? Link here for architectural drawings of the proposed exhibit and the Missouri State monolith. Tuesday, August 21st at 9:00AM join Gordon Moore of the Maine Forest Service and Ron Olson Soil Scientist of the USDA at the USDA Office in Dover - Foxcroft for a Wetlands Delineation and Identification Workshop. Information will be presented about wetlands indicators, function, value and management. A field session at a nearby wetland will include information on soil indicators, vegetation indicators, hydrology indicators, and management. Participants are requested to wear rubber boots and bring bug repellent. Snacks and beverages will be provided. This workshop is being co-hosted by the Small Woodland Owners Association of Maine and the Piscataquis County Soil and Water Conservation District. CEU's are available for Foresters, Certified Logging Professionals and also Code Enforcement Officers for participation in this workshop. There is a $5.00 registration fee to cover workshop costs. Pre-registration is required by Wednesday, August 15th by calling 564 - 2321, extension 3, e-mailing: info@piscataquisswcd.org, or stopping by the district office at 42 Pine Crest Drive, Dover - Foxcroft, ME 04426. For last year's analysis, references, and photos from this important Suborder, the Aquods, with Great Groups Duraqouds and Endoaquods, click on the Bhsm horizon in the photo. Reknowned botanists Georgia Hall, Lauren Stockwell and Matt Arsenault were on hand to assist in keying out difficult taxa. NOTE: The NH Board of Natural Scientists has awarded this workshop 1 CEU for both Certified Soil and Wetland Scientists. WRITE-UP AND PHOTOS TO APPEAR SHORTLY. Several JOBS are open for applicants....Check out the JOBS link in the left navigaton column. Soils students will again be seeking 120 hours for internship requirements; time schedule is flexible, can be more (such as an entire summer), or 1 day per week, or other format. They would need to be paid employees. For more information, contact Dr. Samanth Langley-Turnbaugh at the University of Southern Maine. MAWS announces its Fall training schedule for 2006. Focus on vernal pools in October. This workshop is run in conjunction with the State of Maine field exam for new site evaluators. The format will differ past years and feature up to 12 backhoe-dug soil pits in a variety of parent materials, drainage classes, and bedrock classes. This is a non-regulatory workshop for MAPSS members and other interested wetland and soil scientists. The focus is on education and training in describing soil properties and morphologies. NRCS soil experts will be on-hand to assist in describing the soil pits. See the link at the left Past Events & Workshops for an indication of the format for this important soil workshop. REGISTRTION INFORMATION: Soil pits open at 8am on the Pelletier Property, in Orrington. Cost is $10 for MAPSS members, includes cookout lunch. DIRECTIONS: From I-95 in Bangor, take exit 182 for I-395 East to Brewer. Immediately after crossing over the Penobscot River, exit to Route 15 south toward Bucksport. Drive south on Rt. 15 ~6.5 miles to a wide area in Rt. 15. Parking for the Field Day is on the left (east) side of highway, through fence opening. Please E-mail MASE organizers or Gary Fullerton at 856-0277 if you want lunch!!! This organization hosts 3 days of field trips, including Quaternary (soils, geomorphology, glacial geology, hydrogeology, ....). Visit the NEIGC Website. This 4 day event features students from top soils universities competing in the field to describe soil morphology, taxonomy, and geomorphology. The year's event will be hosted by The University of Maine - Orono. UNH SOIL AND WETLAND COURSES offered for late fall 2007 and 2008. Download the PDF information here. MAPSS is again fielding an informational booth for 2008 adjacent to the Maine Soil Testing Lab booth. Several backhoe-dug soil pits at the fairgrounds will be open for those interested. A PowerPoint presentation on Maine soils will be given also. For information on helping with this event (a bonus being free admission), please contact: Dave Turcotte for more information. Summer edition of The Lay of the Land will be mailed to MAPSS members in July, 2008. The on-line version will be posted 2 weeks later. August 2nd, 2007 The joint MAPSS-MASE Natural Resource Identification and Regulation Workshop was held under clear blue skies at Reid State Park. Approximately 149 natural resource specialists attended this day-long workshop. Professionals from the fields of soil science, wetland delineation and permitting, site evaluation, code enforcement, planning, and regulatory agencies participated from 9am until 3:30 pm. A series of photos with brief captions follows. Thanks to Dave Moyse, Dave Rocque, and Chris Dorion for the photos. The workshop outline and workshop overview can be downloaded in PDF format. April 25th, 2007 MAPSS presented the University of Maine's Soil Judging Team with embroidered field vests, caps, and bucket "Jockeys". This field equipment is to be used for their soil judging field work and Northeast competitions. We have had five MAPSS members contribute $681 to the education fund (which is not a separate account), including Alan Burnell's contribution of $256 to specifically cover the costs of the logos. The $471.24 was something that we voted on as the association to fund, so that much is directly attributable to MAPSS. From the individual donations then we have $681 - $256 ($425) to go towards educational purposes plus whatever the group votes on funding this year. We have not paid any money for anything other than the vests and logos at this time. October 7th, 2006 The 2006 Northeast Regional Soil Judging Competition was held on a brilliant fall day under clear blue skies. The University of Maine - Orono and the Natural Resources Conservation Service (NRCS) organized this 3 day event. MAPSS President Chris Dorion compiled the write-up and photographs. September 1, 2005 The Maine Association of Site Evaluators/Maine Association of Professional Soil Scientists Training Session was be held on Thursday, September 1st on Winthrop Street in Hallowell, just north of the Town Farm Road. The site evaluator pits were open for review from 9 AM onward and the MAPSS training pits were open for review from 1 PM throughout the afternoon. MAPSS member Chris Dorion compiled the write-up and photographs. 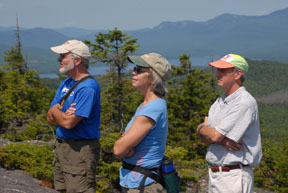 The Maine Association of Professional Soil Scientists held a three day workshop and tour in Downeast Maine. 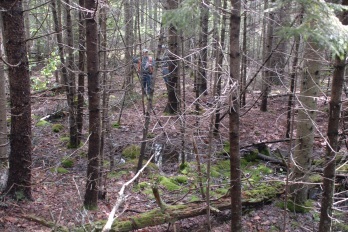 The focus of the tour was Section XIII, "Problem" Soil Areas, as described in the Field Indicators for Identifying Hydric Soils in New England. Go to the NEIWPCCwebsite for complete information. 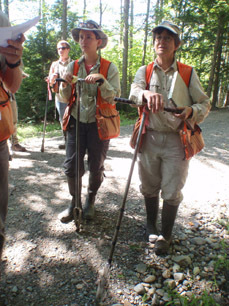 MAPSS soil scientists, led by the State of Maine Soil Scientist Dave Rocque, brought the group to multiple sites displaying A) Folists and soils with folistic epipedons, B)Soils formed in red parent material (Perry Formation sandstone and conglomerate), and, C) Histosols. 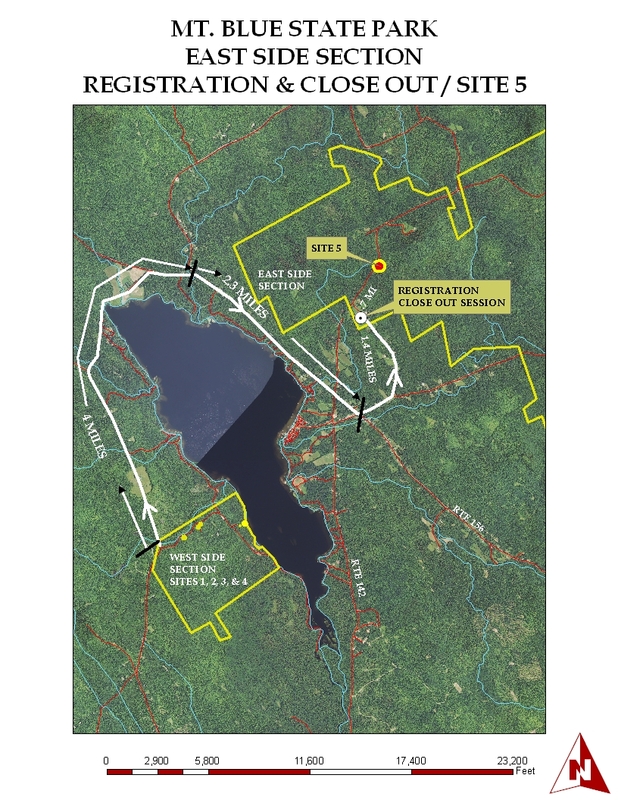 MAPSS member David Rocque compiled the report while Chris Dorion submitted annotated photos. This MAPSS workshop was made possible by prior collaboration with the New England Hydric Soil Technical Committee and NRCS Soil Scientists Dave Wilkinson and Wayne Hoar. September 16th, 2004 The Maine Association of Site Evaluators/Maine Association of Professional Soil Scientists Training Session was be held on September 16th in Corinth, Maine, ~1 mile west of Route 15 and south of Route 43. The site evaluator pits were open for review from 9 AM onward and the MAPSS training pits were open for review from 1 PM throughout the afternoon. 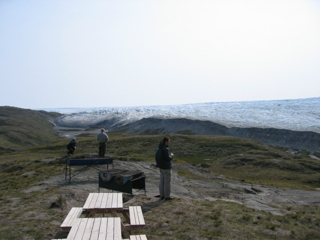 The site was located on and adjacent to an esker. NRCS soil mapping in this area revealed two associations of soils, based on two parent materials: marine sediments (Swanville-Boothbay-Lyman) and glacial till (Dixmont-Thorndike-Monarda). This area is undergoing re-mapping by the NRCS, and an emerging paradigm is taking shape to account for the PARALITHIC, lime-seamed, often SAPROLITIC bedrock. A proposed new catena, the SEBASTICOOK CATENA, will more accurately describe this type of bedrock and the typically occurring soils found on this lithology. NRCS soil specialist Dave Wilkinson and State soil scientist Dave Rocque described the soil pits prior to the workshop. Parts of the write-up are from their soil logs. MAPSS members Dave Turcotte and Chris Dorion took the photographs and wrote these summary descriptions.